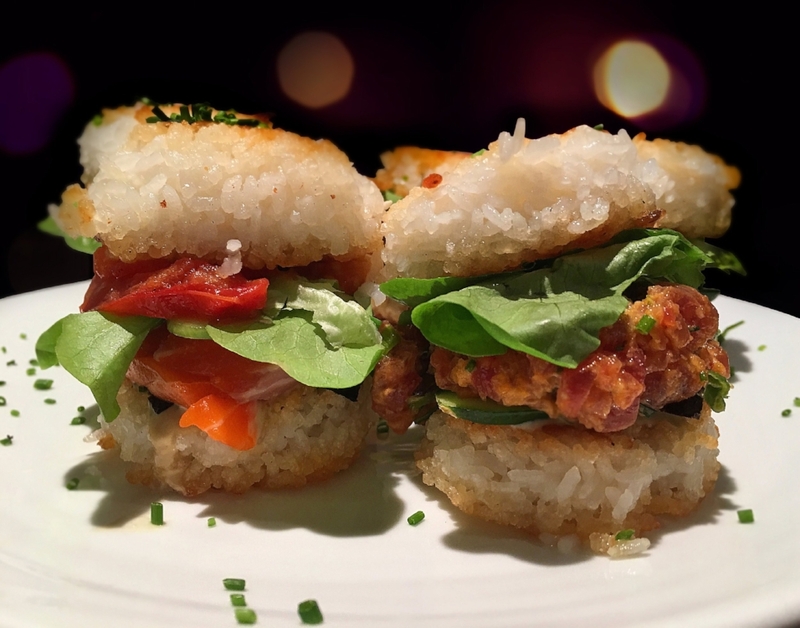 I'm a HUGE fan of crispy rice spicy tuna so I got thinking: why can't we use crispy rice to make slider buns!? You can! I won't lie to you, this recipe is medium-to-advanced level here, but only because a certain amount of care is needed with rice. It's sticky & tricky. But it's totally worth it! This dish is delicious. Note: these are great for homegating/hosting a watch party at home. I wouldn't recommend them for tailgating, especially on warmer days. (Warm days + raw fish = not so much). Using a sharp knife, mince the raw tuna. Add into a medium-sized mixing bowl. Add into the bowl the mayonnaise, hot sauce and 1/2 cup of the minced chives. Mix well and set aside in the fridge. Follow the directions on your sushi rice package to make the sushi rice. Once cooked, place into a bowl and chill until it's cool enough to manipulate with your hands. Once the rice is cool enough, it's time to form your buns. You'll want to keep your hands as wet as possible as Japanese sticky white rice, once cooked, will stick to your hands and fingers as well. Water helps to minimize sticking. You'll want to form two kinds of patties: 1) The Bottom Bun - about 2 inches in diameter and flat; and 2) The Top Bun - also about 2 inches in diameter but slightly rounded on top like a regular slider bun. Form equal numbers of top and bottom buns and side aside. Fill a medium skillet with oil, about 1/2 inch deep, and heat over high heat. Once the oil is hot, add your rice top and bottom buns into the skillet carefully (we did two at a time). Fry each side until golden brown, about two minutes, flipping carefully so as to ensure the buns don't crumble apart. Carefully remove the fried rice buns from the heat. To form your sliders, place your bottom buns on your serving plate. Top each bun with a few cucumber rounds, then a healthy dollop of spicy tuna, the lettuce and then your top bun. Garnish with the remaining chives and serve! Add about 2 tablespoons of oil into a medium sized skillet over medium to medium-high heat. Add in your tomato slices and a dash of pepper (start with about 1/2 teaspoon and add more to taste), stirring occasionally. Once the tomatoes start to break down and get mushy, add in your garlic and pan sauté for another 2 - 3 minutes, stirring often. Remove from heat and set aside. In a small mixing bowl, combine the mayonnaise, wasabi, rice wine vinegar, lime juice, soy sauce and 2 tablespoons of minced chives. Whisk together until fully emulsified, adding more mayonnaise if you prefer a thicker consistency. Set aside. Fill a medium skillet with oil, about 1/2 inch deep, and heat over high heat. Once the oil is hot, add your rice top and bottom buns into the skillet carefully (we did two at a time). Fry each side until golden brown, about two minutes, flipping carefully so as to ensure the buns don't crumble apart. Carefully remove the fried rice buns from the heat and set aside. To form your sliders, spread your wasabi mayonnaise mixture both on top of your bottom bun and on the underside of your top bun. On top of the bottom bun stack your salmon (1 - 3 slices of salmon per slider, depending on the how much salmon you have--so all sliders get enough), your lettuce, the sautéed garlicky tomatoes and then the top bun. Garnish with chives and serve!